Applications for LE Mongolia are closed! Volunteers will fly into Ulaanbaatar, Mongolia and arrive by May 29 where they will meet their fellow team members along with the Program Director and stay in a local Mongolian hostel for a welcome dinner in the country's capital. The following two days (May 30-31), volunteers will begin orientation in Ulaanbaatar, locating needed classroom supplies together and exploring the region to sightsee. Orientation is used to help familiarize volunteers with Mongolian education system, how to create lesson plans, and will allow the volunteers to opportunity to get to know each other. On June 1, volunteers travel to Darkhan City from the early-afternoon to evening time. Here, the volunteers will meet their individual host families and have a traditional Mongolian dinner in their host home! On June 2, the fourth day of the program, volunteers will meet their teaching assistants and visit the School of Technology classrooms with the Country Coordinator. This is where volunteers will teach English to local Mongolians, primarily 5th to 8th graders, for the duration of June. The rest of the day will be left for volunteers to lesson plan and get to know their host families. Teaching will begin the morning of Monday, June 3rd. The Mid-Point break will be from June 15th-16th and details about the break are TBD. A finalized schedule will be created once volunteers are hired. Closing session will be held on June 27 once all teaching is complete. Here volunteers will reflect on their recent experience and we will go over ways the program can be improved and how they can continue giving back to the host community or bring LE’s ideas into other work. Once the team arrives back in Ulaanbaatar on June 28th, volunteers may then leave for home or travel with other volunteers. Flexible: Lifestyles are often slower paced than the US and volunteers should be able to handle last minute changes. Accommodating for students: Some Mongolian students are extremely disciplined while others see this as a fun opportunity to improve their English. Do not be surprised if students ask for “extra homework.” Try to find a balance between a fun and serious classroom. Open to new experiences: Families often take volunteers to the countryside where there is sometimes no running water or electricity. Volunteers should be able to go without Western Amenities for at least one day. In Mongolia, volunteers will all live in Darkhan City, Darkhan-Uul province. Students will range in age from elementary school to high school as well as have a varied level of English. Volunteers will live with their university teaching assistant, and travel to and from school alongside their teaching assistant. Ulaanbaatar, where volunteers fly into during orientation and out of as closing session concludes, is a rapidly developing city in a developing country; therefore, volunteers should not be surprised to find a variety of ‘western’ as well as Mongolian options for food, shopping, movie theaters, etc. Lifestyles may also be different than what volunteers are used to and should be prepared to deal with some challenges. Darkhan City is an industrial region; 82% of the population are in the Darkhan-Uul airmag/province live in the city versus 18% rural living. Darkhan City was a large manufacturing site, heavily funded by Soviet Union for this purpose in 1961 on the Trans- Mongolian Railroad. Its industrial base collapsed in early 1990’s, and today it remains an industrial city – containing a large steel mill, textile production, and many educational centers such as universities and high schools. This province held the first provincial City Hall in Mongolia’s history in April 2010. Darkhan City is the third-largest city in Mongolia, the second largest educational center (behind UB), and overall, has a high education level in the city. Volunteers are encouraged to see all that the city has to offer and to spend time with host families. All volunteers will be living in close proximity to each other within Darkhan City and are encouraged to work together. It is also a great idea go on the excursions your host family may take you on and to explore the city with host siblings. LE volunteers will teach at the School of Technology in Darkhan City. The School of Technology is a public school, a branch of the Mongolian University of Science and Technology (est 1991), wherein 120 students in 8th-12th grade study mostly on STEM, and 1,000 students total are at the university and high school combined. At the School of Technology LE Volunteers will be collectively working with approximately to 100-200 students; students of all ages are invited openly from around the region to join the LE summer program during their summer break, not just those who normally attend the School of Technology. During their stay in Mongolia, volunteers will begin their lessons as the school year ends. Volunteers will teach classes of about 20-30 students in secondary school alongside their teaching partner with some little-to-no English instruction. Volunteers may also be teaching more than one class a day. Volunteers will also be asked to conduct an after school activity specific to their own set of skills. These after school activities will be held 2-3 times a week for approximately one hour after school. Volunteers may teach a variety of subjects from art to physics to computer programming to another language. The original founding of LE’s Mongolia program was very much fate. A former board member and founding father of LE, Niko Canner, was in Mongolia in 2012 at the World Economic Forum. There, he met Enky Zurgaanjin (LE Mongolia’s Country Coordinator from 2012- 2017). Niko pitched the idea of LE Mongolia to Enky, who responded enthusiastically. State-side, PY12’s Managing Director, Nhaca Le, developed a personal passion for all things Mongolian. When she heard at LE’s annual Board Retreat the potential for a pilot program in Mongolian, she jumped at the chance. In 2017, PD Rose Trafford (LE China 2011 volunteer), led a team of 6 volunteers to teach English in the capital of Ulaanbaatar for the sixth consecutive year of LE’s Mongolia program. For 2019, the LE Executive board decided that the Mongolia program, after years of wonderful work by hardworking volunteers and staff in Mongolia’s capital, would do well with a re-pilot to reach out to communities outside of its previous regions of service. As such, LE Mongolia begins a new pilot year in Summer 2019! Prior volunteers Alina Saif (China PY17, Mongolia Ant-PD 2019) and Olivia Wong (Mongolia PY17, Mongolia PD 2019) have teamed up to structure a new program which leads volunteers a Trans-Mongolian railway ride away from urban capital of Mongolia to the industrial province of Darkhan-Uul. Alina helped build a supportive network of individuals in-country for LE to communicate within 2017, and decided to take the role of LE Mongolia’s Ant-PD! The detail work to the new Mongolia PY19 program was aided by Olivia’s previous experience with nonprofit work in Mongolia’s capital as an English teacher in 2017, and other involvement with international service projects in years prior. This year the pair combined their efforts and met in Washington D.C. during Learning Enterprises’ annual Staff Training Weekend to collaborate and cement their plan for an innovated, sustainable LE program in Mongolia’s Darkhan City. The rest is yet to come! MEET YOUR PROGRAM DIRECTOR, OLIVIA! Olivia graduated from UC Berkeley in 2017 where she studied Philosophy and Linguistics to learn more about how people are connected in the world. She was involved with a few different non-profit organizations that support youth while an undergrad; and with a passion for expanding educational resources available to people internationally, as a post-grad she's created her own social project with friends which donates children's books to underdeveloped areas. In 2017, Olivia taught English in Mongolia with Learning Enterprises and was inspired by the kindness from her students and host family! 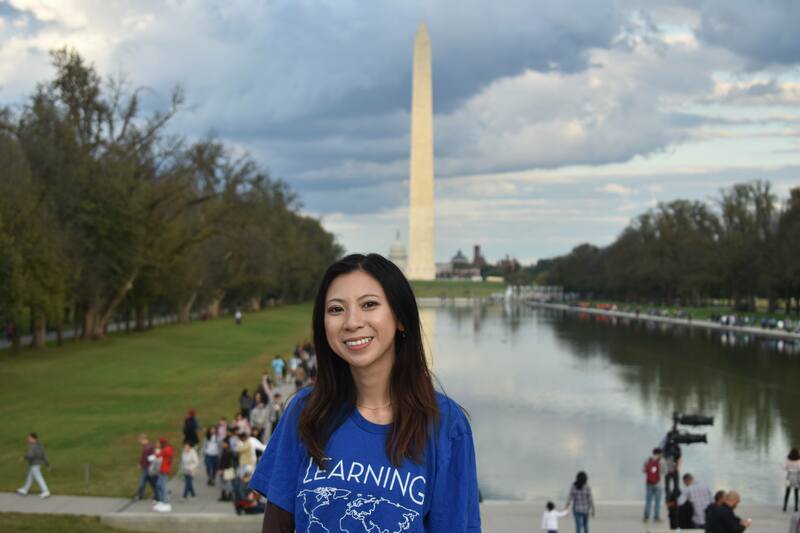 As the Mongolia Program Director for 2019, Olivia is so excited to return to Asia and help continue spreading LE's mission! She's wholeheartedly determined to make the upcoming year's program in Mongolia lead to memorable and positive future experiences for LE volunteers and the students whom they serve. Interested applicants can contact Olivia at mongolia@learningenterprises.org.